Jim Wagner attended the Orange County Sheriff’s Training Academy (Police Academy Class 104) and graduated on June 17, 1991 on its thirty-seventh year of operation. The Academy first opened its doors in October of 1954 offering a five week basic course in what was then, the latest techniques in criminal apprehension and crime prevention. Originally located at the Orange County Peace Officers Association pistol range in Orange, the training center furnished instructional aid and expertise using members of the Federal Bureau of Investigation (FBI) and local law enforcement agencies and instructors. In 1965 the Academy began using full time staff, providing training that not only met but exceeded the requirements of the Commission on Peace Officer Standards and Training (POST). Classes then covered patrol procedures, investigation, public relations, general administration of law, firearms, and physical fitness. 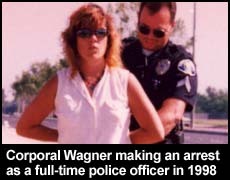 In 1991 when Recruit Jim Wagner attended the Academy it was located on Newhope Street in the city of Garden Grove; its location since 1985. Jim’s training included twenty full weeks (800 instructional hours) in patrol procedures, investigation, State and federal law, pistol and shotgun (the use of the new computerized Firearms Training System FATS, physical fitness, arrest & control, defensive tactics, a trip to the morgue, courtroom testimony, and scenario training at the state-of-the-art training center known as Laser Village. The sheriff at the time was Sheriff Brad Gates and the Academy Commander was Lieutenant Steve Carroll. 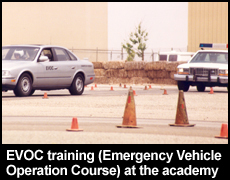 The Orange County Training Academy was only one of six “stress academies” left in the State of California at the time. In fact, it was even more difficult than the Los Angeles Police Department who was considered the trend setter. A stress academy is a police academy run in much the same way a military Boot Camp is run: lots of yelling, degrading, tearing down, full contact matches among recruits, and a lot of mental stress – in other words, perform well or lose your career. 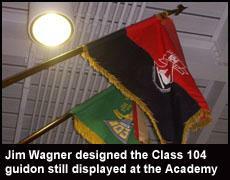 Jim Wagner’s class one of the smallest in numbers in modern history numbering only 21 men. Those graduating came from the following agencies: Anaheim Police, Corona Police, Costa Mesa Police (Officer Mitchell Johnson and Officer Jim Wagner), Fullerton Police, Garden Grove Police, Huntington Beach Police, Newport Beach Police, Rancho Santiago Community College, San Clemente Police, Santa Ana Police, and Orange County Sheriff’s Department. 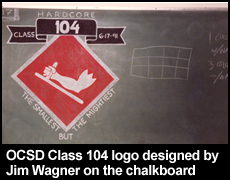 Class 104 (class motto: The Smallest but the Mightiest) was taught by 61 different instructors from a wide variety of law enforcement agencies, and run by 12 Tactical Officers. Since there was a high ratio of instructors to students Class 104 was worked hard earning them the Esprit de Corps award, which few academy classes in the history of the academy had achieved. In their graduation group photo two of the classmates proudly hold up the plaque. Jim Wagner was selected by his class 104 peers to be the Class Chaplain and gave an invocation at the graduation ceremony followed by a benediction given by Monsignor John Sammon. At the graduation ceremony Officer Jim Wagner was sworn in as a full-time paid police officer by Captain Rick Johnson of the Costa Mesa Police Department. Two days later he was out on patrol with his first Field Training Officer (FTO) Senior Officer Phil Myers.